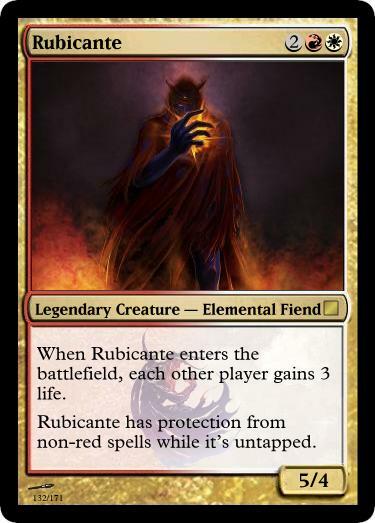 IV: Rubicante is the elemental fiend of fire, and is considered the leader of the four fiends in the game. He is an honorable being and believes in fair fights, so before confronting the player characters he heals them to full health. This is represented by the card’s life gain enter-the-battlefield ability. The second ability represents his cloak, which he can cover himself with in battle to grant him invulnerability to all non-fire spells. IX: Tantarian is an optional boss battle. It starts the battle inside a book; whenever the player damages it the book will flip to a random page, which Tantarian may or may not be hiding in, and only after being revealed can it be properly fought. 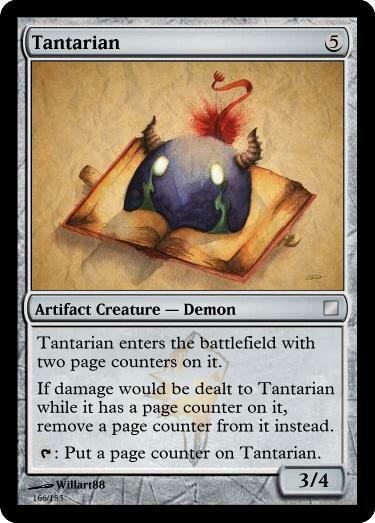 Additionally, after being revealed, Tantarian may hide inside the book again and begin the cycle anew. The page counters represent Tantarian hiding in the book and being resistant to damage. X: Sin is one of the main antagonists of the game, and defeating it is the characters’ ultimate goal. Throughout the history of the world, Sin has been defeated by sending a summoner on a pilgrimage, ultimately having that summoner sacrifice themselves and a companion at the end of the journey. This doesn’t actually kill Sin, however; over time, the summoner’s companion will actually become Sin themselves, beginning the cycle anew. 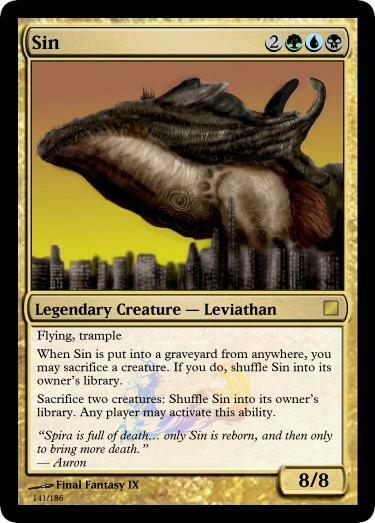 I tried to represent this with the shuffling: you got rid of Sin, but it will rise again.